Flags of Our Fathers - when??? Anyone know the date of when this coming out? All I remember is that it's In early 2010. Re: Flags of Our Fathers - when??? yeah - I'm looking forward for this to drop! I think this MAY be droppin in February. BP is on hiatus then but it makes ZERO SENSE for BP to be off track in Black History Month. BP has NEVER missed February since RH debuted with Marvel. SI, I found that info btw. Also I agree. I can't wait for this. I reread Hudlin's CW issues and they were awesome. Great stuff. I can't wait for this. Yeah, that's at the top of my pull list. MINE TOO!! Btw,has everyone noted how SCARILY QUIET that RH and DeC (Denys Cowan) are? You just KNOW that those brothas are cooking up something that's gonna make the fanbratti go apoplectic!! I have visions of them sitting around laughing like mad scientists. Reggie's always managed to spin some wild yarns, so I'm expecting mad action. Thank you Jonathan. Far as I know, it's still on track for February. Denys is drawing the hell out of this thing. The action is ill...in fact, some stuff was too graphic and had to be toned down. the one two punch of DOOMWAR and BP/CAP is gonna rock heads. Any chance of the stuff that got cut out being posted anywhere? HEF exclusive, pretty please? Yeah, It should be posted uncut when the Hardback version of it comes out. Consistent question asker Spidey616 is back again this week, and I'm sure some board folks bristle as his frequent success rate, but he asks great questions that no one else thinks of! He does! He knows his Marvel. What can I tell you? I've often cited Spidey616 as our #1 fan. He comes to all the events. He's at every convention. He's a great guy, and he knows his Marvel stuff. 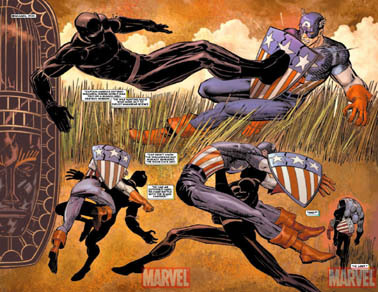 This week, he asked, "I was wondering what the status was of Reginald Hudlin and Denys Cowan's 'Captain America/Black Panther: Flags of Our Fathers' mini that was announced last summer since it hasn't been solicited yet?" That's going to be out this April of 2010. It's four issues by Reggie Hudlin, Denys Cowan and inked by Klaus Janson. Look for it! Denys is done with the first two issues. His art is SICK.